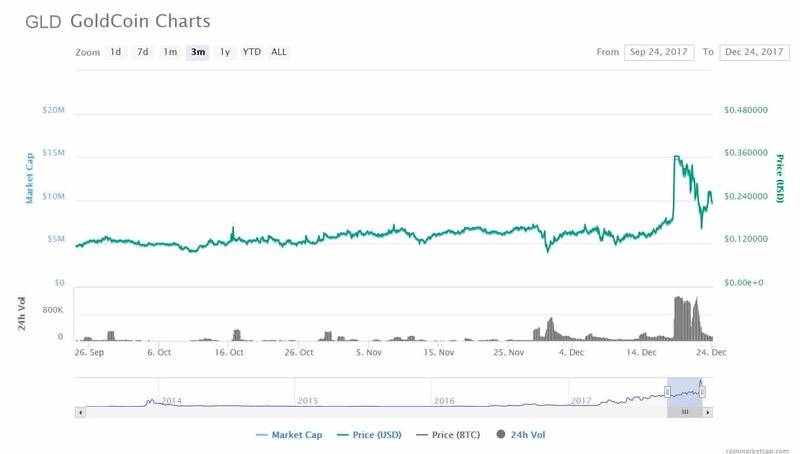 Just as GOLDCOIN (GLC) doubles in price to $0.34, one of the founders of Bitcoin.com admits management flaws for BTC, and shows why GOLDCOIN (GLC) will continue to attract users from other cryptocurrencies. In an interview on Dec. 12 with the Swedish periodical BreakIt, Bitcoin.com founder Emil Oldenburg bitcoin’s transaction times, costs and lead times have undercut bitcoin’s value as an wealth builder. Oldenburg has reportedly sold all his Bitcoin and bought Bitcoin cash, but this has not been confirmed. GOLDCOIN (GLC), because it follows the path laid out by Satoshi Nakamoto when he invented the cryptocurrency concept in his original Bitcoin white paper of 2008, has addressed and resolved all the issues Oldenburg refers to. And GOLDCOIN’s (GLC) network is now 10 times faster than that of Bitcoin, he notes. GOLDCOIN (GLC) can already scale much larger than that, with existing hardware for a fraction of the cost. It never really hits a scale ceiling. The existing Visa credit card network processes over 20 million Internet purchases per day worldwide, but GOLDCOIN is much faster. What’s more, GOLDCOIN (GLC) has undertaken a major upgrade of its network which will make it safer and better-performing, with three new skilled developers added to the staff. GOLDCOIN (GLC) mining is also carefully managed. And GOLDCOIN (GLC) has provided secure defenses against 51% attacks and ASIC threats. GOLDCOIN (GLC) also is protected by the proprietary Golden River algorithm which optimises the proof-of-work difficulty for changing demand conditions. The creation of an IOS wallet will soon make it easier for traders to place funds in the crypto-currency. An Android wallet is already popular. And the GOLDCOIN (GLC) roadshow, which will kick off in the Spring 0f 2018 with a Conference Tour that will allow the team to showcase our technology and new software to the crypto-currency industry. “This is why traders prefer GOLDCOIN (GLC) over other cryptocurrency choices,” Matthews concludes.